Nandan's UIDAI dream - Imagining India truly! His greatness lies in his all-surpassing intelligence blended with humility. One of the most successful Indians by any (all) standards, Mr Nandan Nilekani made a lasting impression on the audience today by his candid assessment of what he thinks of his UIDAI project. First things first. Nandan is an IIT graduate, an icon of the Indian industry, India’s services-sector face to the world, one of the richest Indians, Über-cool (given his style and the way he carries himself! ), and of course, one of the men who created Infosys. And then he gave it all up on one call from the Primer Minister of India. For what? For a government project. But wait a minute. This project is far bigger in scope and impact – it will touch every Indian’s life. It’s the UIDAI – Unique Identification Authority of India project. The Unique Identification Authority of India (UIDAI) has been created as an attached office under the Planning Commission. Its role is to develop and implement the necessary institutional, technical and legal infrastructure to issue unique identity numbers to Indian residents. On June 25th 2009, the Cabinet also created and approved the position of the Chairperson of the UIDAI, and appointed Mr. Nandan Nilekani as the first Chairperson in the rank and status of a Cabinet Minister. 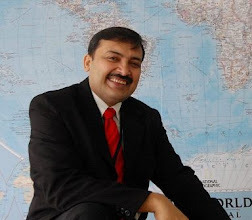 Mr. Ram Sewak Sharma has been appointed the Director General. The role that the Authority envisions is to issue a unique identification number (UID) that can be verified and authenticated in an online, cost-effective manner, and that is robust enough to eliminate duplicate and fake identities. The first UID numbers will be issued over the next 12-18 months counted from August 2009. The first number would be issued between August 2010 to February 2011. Over five years, the Authority plans to issue 600 million UIDs. The numbers will be issued through various ‘registrar’ agencies across the country. The government of India realizes that the entire idea of public welfare through government intervention rests on some assumptions – the primary one being that various moneys reach the right persons through the right channels. Given the tremendous size of the nation and its myriad complexities, this is of course a compromised ideal, the level of compromise depending again on a host of complex factors. Over years, various kinds of technologies have been deputed to serve the need of speed, simplification and easy service to every stakeholder in the system. For ex: every government department has its own set of hardware and software installed, that is supposed to deliver some standardized output year after year. This has worked in some cases, and failed miserably in some others. There are hundreds of government departments that serve the public, and govern the public. Some of these are Central level, some State, and some others Local level departments. A citizen of India may interact with these departments at different points of contact, throughout his lifetime. The databases generated and collected through these different departments, over years, are full of limitations. Some parts of these are outdated, some are misleading, some are plain and simple wrong, and most are in no position to interact with each other. So there are clearly severe limitations in the way data is serving the public’s needs. And even the departments’ own needs. An all-encompassing vision in data-management has been missing. That’s quite natural, given the sheer scale and diversity of applications, and the different governing structures prevailing in a country the size of India. But there is one simple realization dawning on the policy-makers of India : Unless there is a single common system of identifying every Indian, most of the social welfare schemes (NREGA, Indira Awas Yojana, Mid-day meal schemes etc.) will only produce half-baked results due to continuous leakages. Since these schemes have taken a huge shape with the introduction of the massive guaranteed employment scheme called NREGA, the need for honest and reliable identification of beneficiaries has become a total must. So in simple words – we have to ensure that a Mr Ramkishore of Village Pratapgarh who is taking benefits of 7 different government schemes is actually the same Mr Ramkishore of Village Pratapgarh who is eligible to take those benefits! Thus, the Unique Identification Number of each Indian is the first step in ensuring quality, reliability and consistency of any social welfare scheme (or any other scheme for that matter). Every Indian must have a number associated with his self, that identifies him uniquely. So, the UIDAI is creating the “soft infrastructure” needed to power social welfare schemes and public bodies of tomorrow. To the question of how this “uniqueness” will be ensured, it is obvious that biometrics is one of the best solutions possible. The biometric parameters to be used will be – 10 fingerprints (from 10 fingers in both hands) + the Iris map of both eyes + the picture of the face. These data sets will create a unique set against which duplication etc. will be impossible. The Unique Identification Number will be thus mapped with these biometric datasets. The UI number will be demand-driven. The government will not force it upon the citizens, but will make a lot of services use this number, thereby increasing the need for everyone to have their own UI numbers. The UI number will not be a card, it will just be a number, that can be used on any other card – PAN card, Ration card, School Admission card, Scholarship card, Job card, Guarantee cards – anything! Once the unique number is created, and used on ALL types of other cards (databases) that the user is interacting with, these databases can then start interacting with each other, with at least this one thing in common. Till now, that mutual interaction was totally missing. So a common profiling of any user was not possible. Now, it will suddenly become possible. The UIDAI is created to ensure a unique identity for each Indian, nothing more. They do not promise any miracle out of this. They are only creating the basic backbone on top of which other Application developers can now creatively start building useful products and services. But the UIDAI is limited in scope to creating a unique number. That’s it. So the UIDAI will ensure that whatever and whoever a person claims he/she is, he/she actually will be. How will the Unique Identification Number help the Police department? That is for the Police department to figure out. They have the great tool for identifying people – now they have to work out ways to use this soft infrastructure. Over the next decade, several private sector application developers will emerge who may offer good solutions for various domains. That’s all in the future! Wow! So many things I was not really aware of. Humility – I was amazed to see the way he was carrying himself – no airs at all. Totally at ease with everyone, all the time. Talking straight – I appreciate the way he said “I only promise you a Unique Number, nothing more.” That’s corporate candour for you! The Indian government surely got the right man for this job. Domain knowledge – Nandan surely knows the way software, hardware and humanware have to work together to make a project of this mammoth a scale successful. His track record is all too visible. Guts and Glory – Nandan took a bold decision to chuck his corporate innings and dive deep into new territory – full-time government assignment. That’s boldness for you! Personal credibility – Someone said beautifully once “The messenger is the message.” Mr Nilekani stands tall and his presence itself is the guarantee. Thanks Dainik Bhaskar for this wonderful opportunity and experience! I stand enriched today after this enlightening experience. First of all thank you sir for providing me the card to attend Mr. Nandan Nilekani's talk. I have also attended the very insightful talk of Mr. Nilekani. Today I came to know alot about UIDAI.The concept of 1 person 1 number is very attractive. It will be very useful for every indian specially for illiterate,who don't know how to fill the form for loan,subsidies and other government schemes. Online authentication, Bio-metric Registration, Mobility of data, aplication and privacy will be some unique feature of UIDAI. Sir i have a confusion that is - In his talk he told that there will be no age limit to get a unique number even an infant will have a number. How it can be? if that infant will die then what will be of that number? Wow What a Great Article..came to know lots of advantages of the project.it surely will change the fortune of Indian citizens.Lets hope that UIDAI project goes succesful..Jeetendra Pamnani PT Nasik Centre. Thank you so much for sharing the knowledge about UIDAI and the person behind it, I was unfortunate to attend the talk, but reading your blog gave me the insight about the talk and Mr Nilekani. well sir at first time when I listen about UIDAI will be a unique ID bio-metric card,I thought that what happen if the card is damage but today I got the answer of my question. and one most important thing is that this is very haplfull to last person of the line and also for Indian government. Certainly I have missed a great session. Nevertheless, your blog has compensated me a lot in that regard.It was quite fascinating to hear about the aura that Mr. Nilekani carries along. Even a man of his stature gets intrigued by the complexities of such big projects- an attribute of a common human being . The thing that makes him different from others is his resolute state of mind and sheer simplicity to handle meticulous tasks with alacrity. His instinct to honour the call from PMO is humility par excellence. He is a real Indian Icon. The talk was wonderful and after reading your blog, I'm edified about the project. Excellent analysis. A recent article in Forbes also highlights about Mr. Nandan Nilekani's straight forward success factors. The blog provides complete reinforcement of the whole scenario. I attended the talk and I'm very thankful to you to give me the pass. Sir I am truly a fan of Mr. Nilekani since I read his book and listened his speech on TED. Thanks for your acute analysis of talk. Firstly, thank you for providing such a great opportunity to all the PROTONS, albeit i was not present there. This blog post has enlighten me about UIDAI project and how it will prove its worth for all Indians. But sir i have one doubt that whether this project prove fruitful in rural areas where people are illiterate and if No, then how this project will achieve its ultimate goal. Thank you very much sir and hope that this type of opportunity will keep coming in future also. Surendra - the UID number will become defunct after a person dies. At least that's what seems the logical way for it to happen. Chetan, Aaraj, Jeetendra - thanks for reading and commenting! Munish - it is the pressing need of the hour to have 100s more like Mr Nilekani is India is to catch up on its lost decades. Sahaj - good that you mentioned about the Forbes article. Nice points there! Pratik - yes, you are right in this observation. The savings can be huge! Divyesh - For the rural areas, this will be MOST fruitful, as those who are almost totally marginalised today, will be at last, brought into the mainstream. Yes, it will take time and effort, and there will be mistakes, but the direction is right. Thanks for bringing the brief of Mr. Nandan's talk. Loved the way you blogged this important talk into "easy to understand" bullets. I have got the opportunity to attend the enlightining talk show of Mr. Nandan Nilekani. Thanks to you for giving your knowledgeable insights for UIDAI project. It's a revolutionary project which will completely change the scenario of identification of a person. I think even for the voting purpose this UID should be used because it will be more reliable. voter Id card is erroneous sometimes and it will take long time to correct these errors so UID is a best option for that. Thanks for giving the complete briefing about the project.Surely its given to the right man from right industry.UID project will surely be a revolution in Indian history connecting every Indian with India. Thanks to Govt of India for taking such a great Initiative and all the very best to Mr. Nandan Nilekani and his team to give Indians a new and a unique Identity. I was quite confident about the concept and was hopeful that this would change a lot of things in the country but after attending Mr Nilakani's talk a lot of questions started popping. Just trying to be a devil's advocate here, I think that this is a massive technology and a functional problem for them to solve it anytime soon. The processing power, biometric comparison, whenever you are issuing a new UID checking the finger or retina scans against all the existing records is a massive problem in computing. While there can't be a better person than Mr Nilekani to head this I have my doubts now about how successful this endeavour will be keeping in mind the obstacles. Ofcourse once done it will open up a Pandora's box and being just an autnentication API it can open up a Pandora's box of application. I can think of so many ways in which external solution developer can use this API to develop solutions that benefits all. It will spawn off a completely new eco-system. I was lucky enough to attend Mr. Nandan Nilekani's session on UIDAI. I salute Mr. Nilekani for undertaking this challenging task and for his contribution to the nation. About UIDAI project I would just say that it is like one medicine for many diseases. Thank you so much Sir for such a nice analysis of his session and UIDAI. Unique ID is an idea whose time had come for India. An IT powerhouse with an ever exploding population has to have its whos and wheres in place. And there is none better then NN to be heading this! A unique ID should empower the masses (rightly said in 6) and help in the budget allocations meeting their goals. Roopz, Vallari, Akshay, Akshay, Avinash, HT - thanks a lot for your comments and value-addition! I appreciate your reading this blog and bringing out aspects that I may have missed out on.